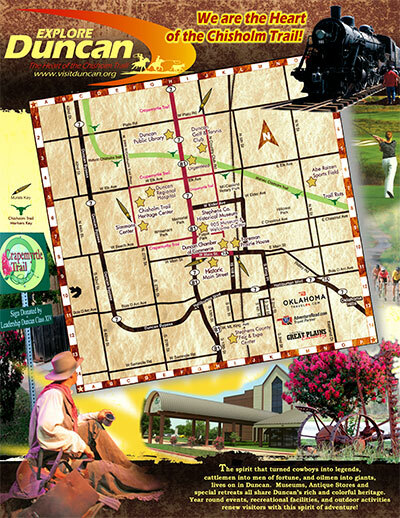 Located in Southwest Oklahoma, Duncan has been a crossroad for cowboys to railroads to oil men. Today Duncan is a thriving community providing history, culture, arts and much more to both residents and visitors alike. The spirit that turned cowboys into legends, cattlemen into men of fortune, and oilmen into giants lives on in Duncan. From the stories of the Chisholm Trail to the new Crapemyrtle Trail, the museums, antique stores, and special retreats which share Duncan’s rich and colorful western heritage is an experience to remember. Year round events, recreational facilities, and outdoor activities renew visitors with the spirit of adventure from the old west. Let Duncan be your home away from home for business or leisure.